I should start by saying that I don't know what an actual chunk of mahogany smells like and I probably couldn't differentiate between mahogany and any other dark aromatic wood. 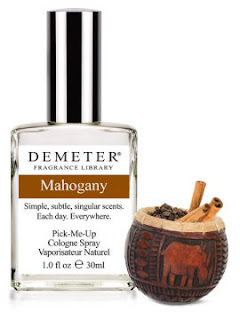 But as it turns out, that's okay, because Demeter's Mahogany isn't just a chunk of wood: it's a men's cologne. A very simple, stripped-down men's cologne, mind you. It opens woody and it stays that way, but it has a slight citrus tinge to it and a ripely fruity quality as well as a spiciness, both subtle, both of which may be inherent in real mahogany, for all I know, or may be added to round out the scent. After that, it's just wood wood wood. If you like simplicity, if you don't demand that every scent you wear be a three-act play, then Mahogany is a terrific choice for everyday wear: unisex, of course, but it veers masculine and lasts for hours, so it's perfect for men who think they don't like to wear fragrance. And, as you might have guessed, Mahogany and Fireplace layer incredibly well, as if they were two halves of a complete scent. 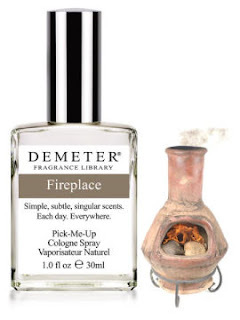 The wood rounds out the smoky-fire quality and tamps down its more aggressive elements, so instead of smelling as if you deliberately wanted to smell like a fireplace (an occasional hazard with the more literal Demeters), you smell like you've been working outdoors. It's a manly aroma, no doubt about it, and a particularly enticing one. I'm really enjoying these Demeter reviews you're doing, pyramus. They're interesting reads.